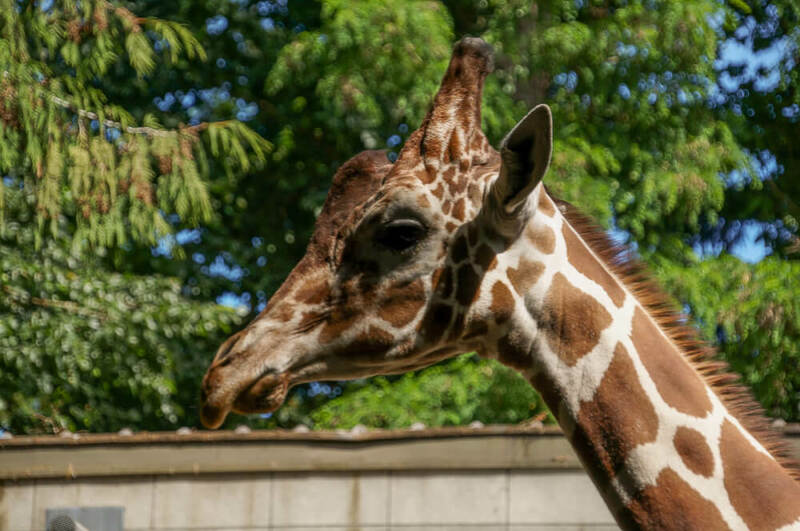 For those who are planning a trip to Seattle with kids, the Woodland Park Zoo is a wonderful stop. It’s a mid-size zoo that is easy to do in one day (or a fabulous morning adventure if you focus on just a few areas.) It’s located in Phinney Ridge neighborhood. 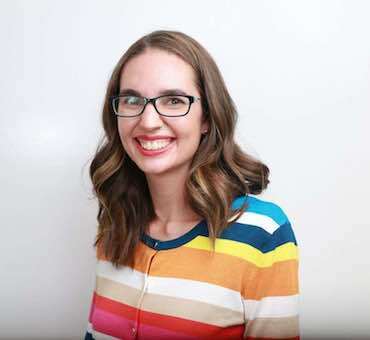 When I was working in the nonprofit sector, I remember a donor telling me that she grew up in the Olympic Hotel and she considered the Woodland Park Zoo her back yard. I ponder this every time I visit because it’s such a fun way to think about this Zoo: as a back yard. It’s a lovely area to take a walk, see some animals, eat a picnic lunch and play. I have vivid memories of coming here on my birthday when I was really little, so it’s very nostalgic and special to be able to bring my own kids. 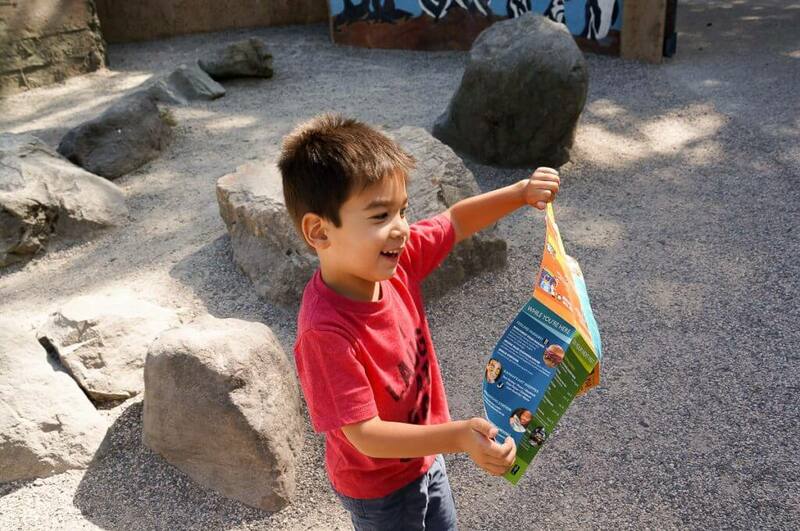 Make sure to grab a map as you enter Woodland Park Zoo! Woodland Park Zoo features animals from around the world. The main exhibits include: African Savanna, Australasia, Historic Carousel, Humboldt Penguins, Northern Trail, Temperate Forest, Tropical Rain Forest and Tropical Asia. 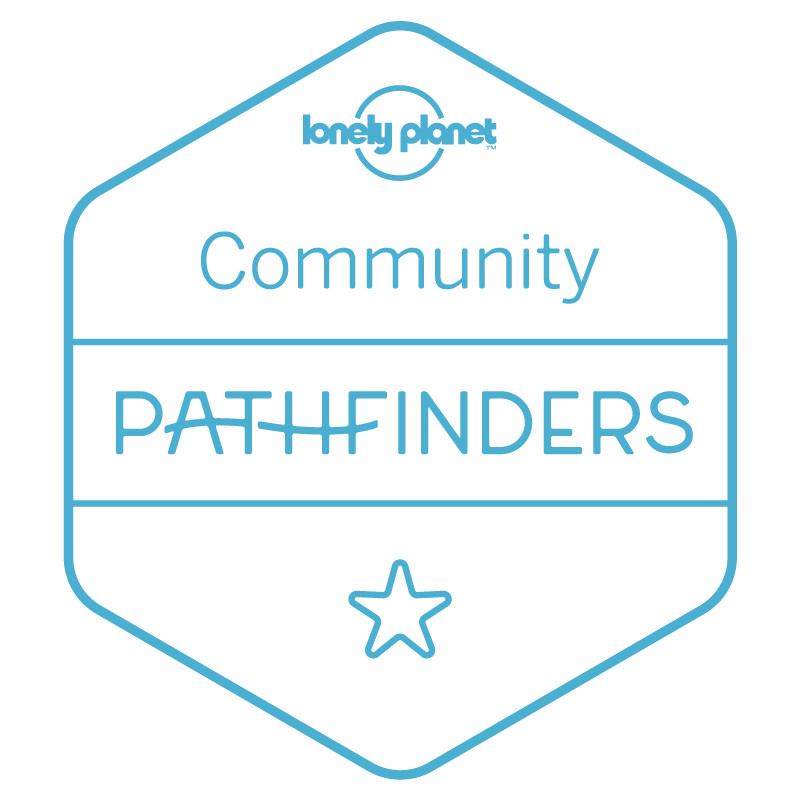 We’ve done all these areas during the past few years and have narrowed it down to our current must-see areas. The baby giraffe made brief appearances the day we visited and we were so lucky to see her! One of the main reasons we went to the Woodland Park Zoo this time was to catch a peek at the baby giraffe. Giraffes are personally one of my favorite animals and we always make a point to see them. 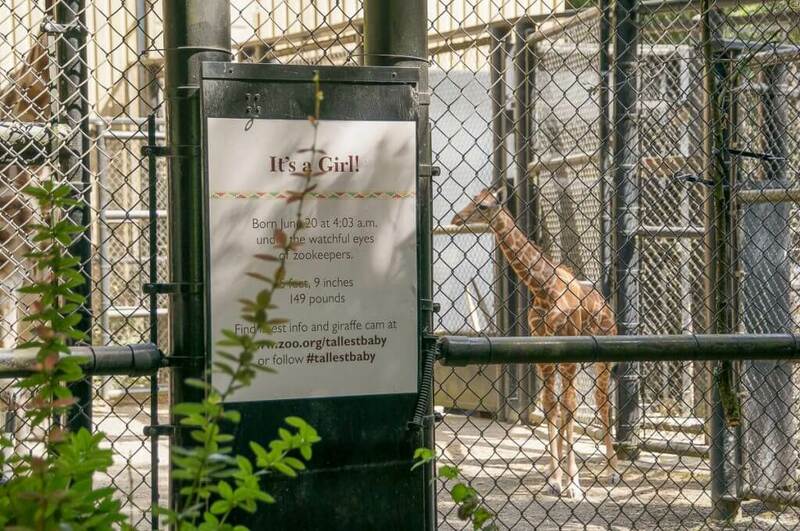 The newest addition is Lulu and her name is Swahili for “Pearl.” We overheard someone say that Lulu was only out about an hour a day, so I was careful to say that we would try to see the baby giraffe. Low and behold, she was playing around outside! It was very interesting to see the adult giraffes circle Lulu as they all bonded together. Local Mom tip: Stop at the benches at the Giraffe Barn from 9:30am-11:30am for snack time and watch Lulu show off. 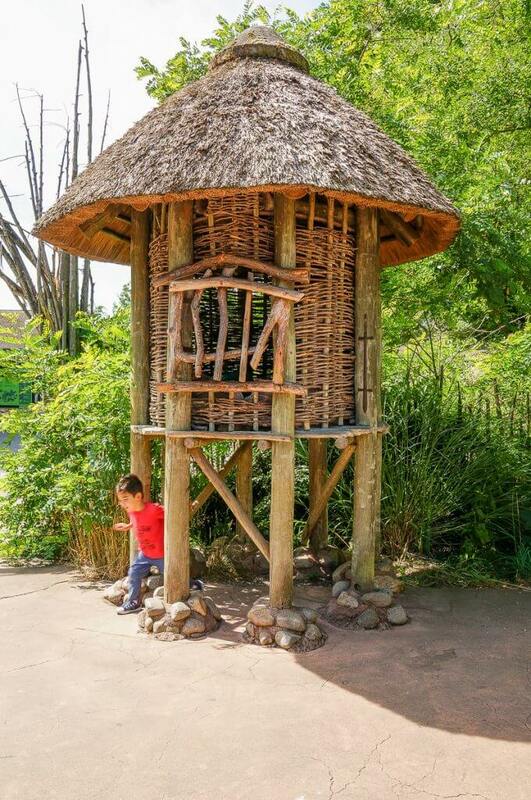 This is one of several buildings in the African Village near their award-winning African Savanna exhibit area. Something that sets apart the Woodland Park Zoo on Seattle from other area zoos is their African Village. It’s a faithful reproduction of a modern rural village of East Africa. I’m impressed with it each time we visit. It also has a viewing area of the African Savanna that will make you feel like you are in The Lion King, as you watch giraffes and zebra roaming together. When the weather is nice, this is such a fun place to burn off energy! I like to think of this as the secret playground. It’s easy to miss on your way to the Family Farm or African Village. It’s in a wooded area and there are tons of benches. I actually nursed my baby while I watched my preschooler crawl through turtle shells and climb up the slides. It’s an ideal spot for toddlers to get out of strollers and move around a bit. Sloth bears are something I don’t see at other zoos. 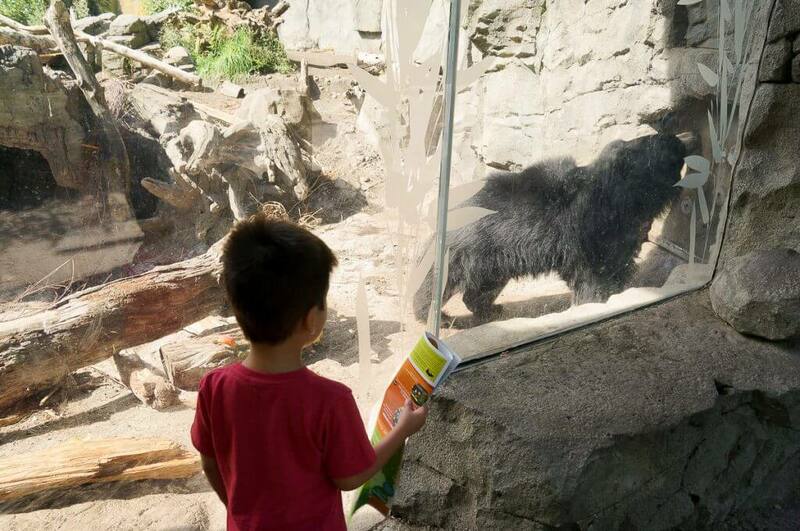 We LOVE seeing the sloth bear because it’s an animal that always comes close to the glass and we can all get a great view. I’m not sure how many other zoos have a sloth bear, but it seems like a great opportunity to learn about a less popular animal This exhibit launched in May 2017, so it still feels new to us. It also includes the tiger area, but the sloth bear rarely has a large crowd. The baby gorilla kept swinging around carefree! 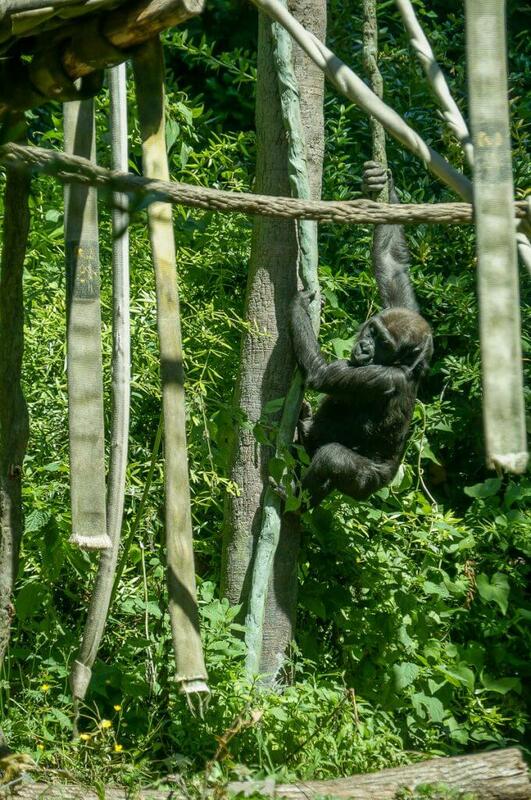 Gorillas are another one of my favorite animals, so we were stoked to discover that Yola was out and about! We ended up searching for the gorillas for an embarrassingly long time because I couldn’t remember exactly where they were located. Thankfully, my son had his trusty Zoo map and together we navigated ourselves to the right spot. The adult gorillas were munching on celery when we arrived. My son was excited to spot baby Yola swinging around on the vines. I kept telling him she was a baby and he was so worried she’d get hurt! 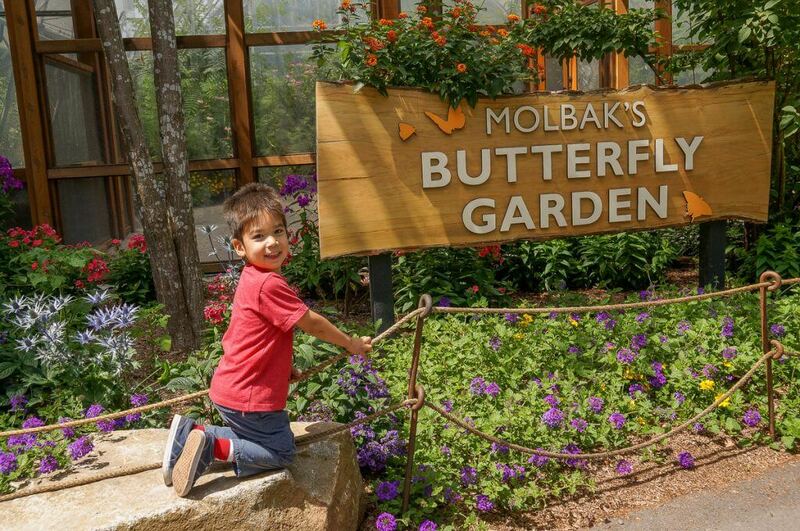 Molbak’s Butterfly Garden opened last year and this was our first chance to explore it. This is a smaller butterfly garden than the one at Pacific Science Center. It’s also seasonal. What I appreciated about the Molbak’s Butterfly Garden is that it has fresh air. We didn’t have to peel off layers of clothes to explore it. Like many butterfly gardens, we were asked to leave our stroller and diaper bag outside. 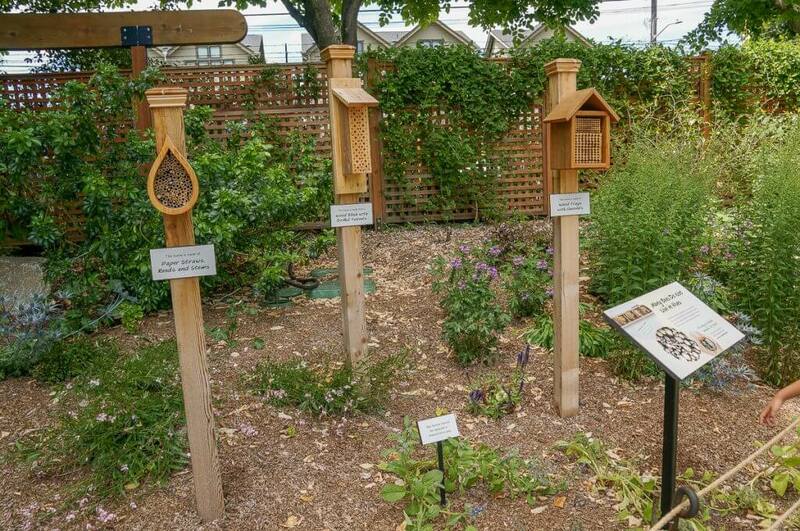 These bee houses are part of the new Microsoft Pollinator Patio. New this year is the Microsoft Pollinator Patio, which is open all year round. It features a Silverspot Butterfly Lab where volunteers and zookeepers hatch and raise endangered Oregon silverspot butterflies. They will later be released into protected wild habitats. 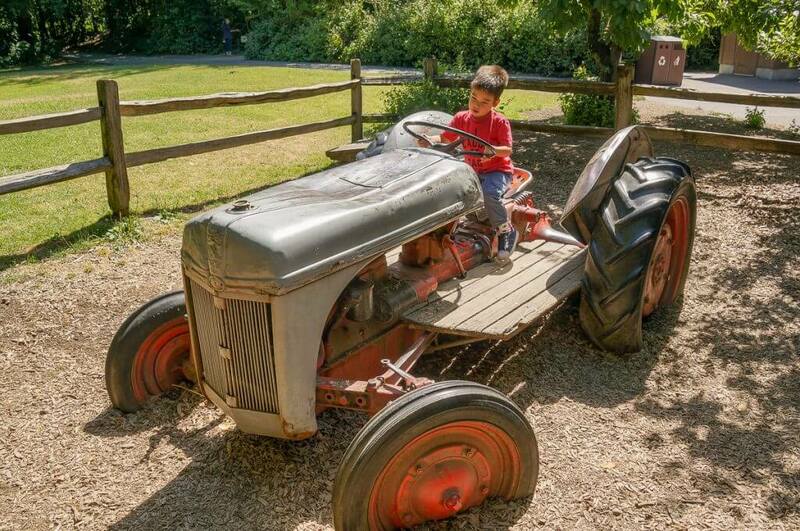 My son loves any chance to ride on a tractor, so this is always a stop at the Woodland Park Zoo. Another one of our favorite parts of the Woodland Park Zoo is their petting zoo and animal farm. The Family Farm is presented by Smith Brothers, who deliver us fresh local milk, eggs and sour cream every week at home. My son isn’t big on actually petting the animals, so we usually just go close to them and then move on. They have chickens, goats, pigs, sheep and cows. They also feature a little worm play area for little kids and a farmers market area. Local Mom tip: Bring paper and crayons to do a fun imprint activity at a statue near the cows. This is always a fun spot to take photos in the African Savannah area of the Woodland Park Zoo. Parking: Arrive early and get the coveted street parking to avoid paying for the lot. Food. Bring your own lunch and splurge on a fun treat like kettle corn or cotton candy. Coffee drinks are available and should be your first stop if you don’t bring your own. Rainy Day Fun: The Zoomazium is an awesome place to stay dry while the kids learn about animals and play. Stroller vs. Carrier: I personally like to bring both with me. We tend to last a bit longer when I can push my 3-year-old and carry my baby from the Zoo to our car. Carousel: This is located in a corner of the Zoo so it’s easy to avoid if you don’t want your kids to see it. It’s $2 for a ride (standing adults are free) and is undercover. Woodland Park Zoo provided me with complimentary tickets. All opinions are my own. I think Lulu is such a lovely name for that baby giraffe. I also have never heard about sloth bears. Where are their natural habitats? It’s such a cute name for a lovely little giraffe! I hadn’t heard of sloth bears, either. They move much more quickly than sloths and I believe they are from India. We’re big fans of learning through play and I love that Woodland Park Zoo offers many opportunities for my kids to learn about animals! What fun! Seattle is a place I really want to visit with the kids. Getting to see a baby giraffe must have been a real highlight. She is just so cute!! I like to give mine the map so they can practice using those map skills with no real consequence for making mistakes! It’s so fun to let kids feel like they are in charge and can lead the way! I love it when places like this have little areas where the kids can run around and play. I was actually just at a zoo last night for a company party and was amazed at how many families didn’t take advantage of the little “secret” playgrounds! Better believe that my friends and I played in them! What a small world that you were just at a zoo, too! YES! Why don’t more families utilize the playgrounds!?! Woodland Zoo is really a nice outdoor picnic for children. There are all those animals which are rarely seen like Giraffe, Gorilla, and also a look alike of African Savannah. 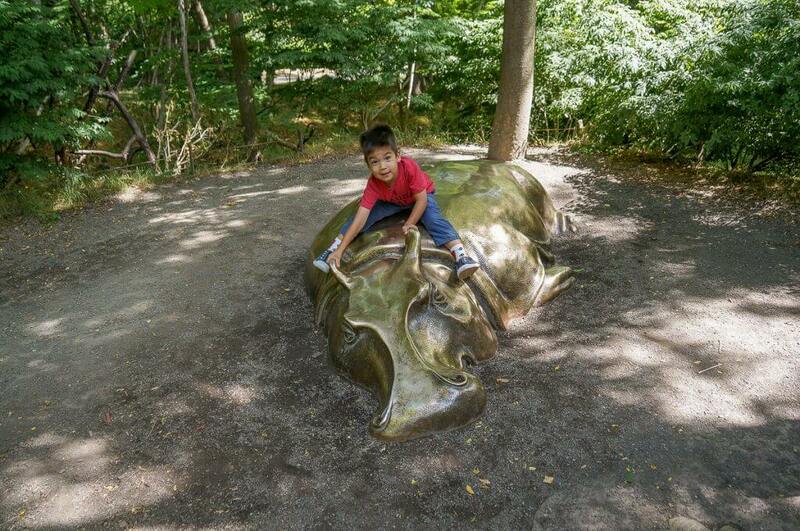 Loved the picture of your son enjoying on farm tractor and rhino sculpture. It’s the perfect spot for picnics! We love watching the animals eat, too! That hippo sculpture is so cool. 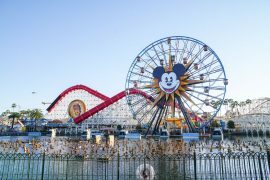 This place is the perfect way to spend a day with family. Such parks can brighten up any day. I could spend hours watching lulu and the sloth bear. Cheers!! 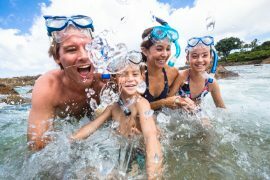 It’s a really fun family outing! And yes, I could also spend hours watching them! A day at Woodland Zoo looks so much fun! It’s so nice that this place has a place ground so kids can play as well. I would like to bring my little brother to here. I think he will love this! Yes, the playground is fantastic! There’s also a large playground just outside the Zoo that many families do before/after they visit. Not very fond of zoos but I guess it is good for kids as a starting point. Later in life, I am sure it will inspire them to get closer to nature and be more compassionate towards other animals. I liked the fact that there is a family farm clubbed with the zoo. That too should teach a lot of things to the kids. I know where you are coming from and I’ve definitely had experiences elsewhere that left me with a bad feeling. I think the Woodland Park Zoo staff does a good job of being advocates for their animals. There’s lots of docents available to educate families about each animal and answer repeated questions from little kids! I love giraffes too! They’re also my favourite animal! You are so fortunate to have been able to see the baby Lulu! I also love the fact there’s a butterfly section – I do believe these are such educational insects that can teach kids lots about the cycle of life. 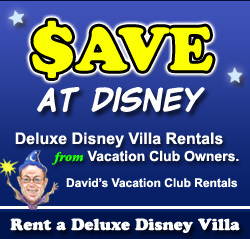 Sounds like a great family trip – my nieces and nephews love going to the zoo. Aren’t giraffes the best? The butterfly garden is a great opportunity to see butterflies up close. We don’t see them that often in nature here in the Seattle-area, so it’s a special treat! 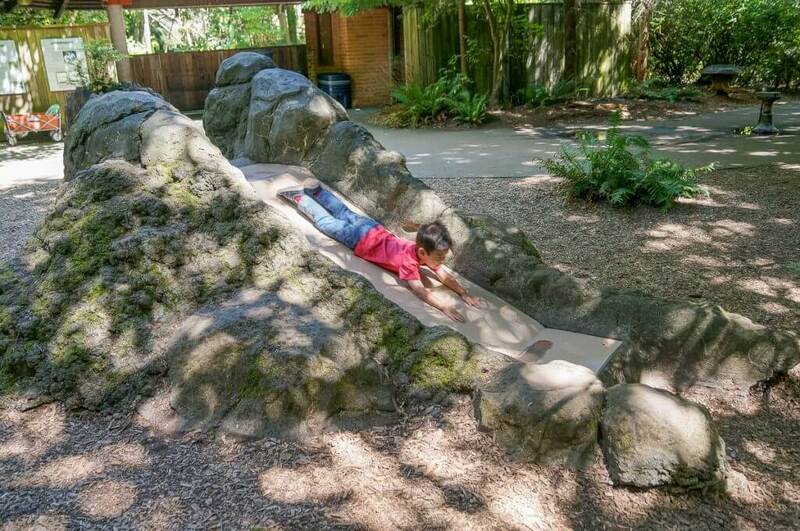 We just love Woodland Park Zoo – this post reminds me that it’s been a few years since we’ve been there, though! It sounds like there are some new exhibits now, too, like the Butterfly Garden! So fun! Go back! They have a few new things you might not have experienced, yet! Plus, I think they might have changed food vendors. That sounds like such a great zoo. My kids love it when we take them to the zoo. It’s such a fun day. Gorillas are one of my favorite animals as well. Ever since I saw them in the wild in Uganda, I’ve been drawn to them. Whoa! You got to see gorillas in the wild!?! What a crazy cool experience, I bet! I love zoos! I think they are one of the best things to explore when going to a new city. That is so awesome that they have so many baby animals and that they are interactive to a degree!! What a beautiful zoo! 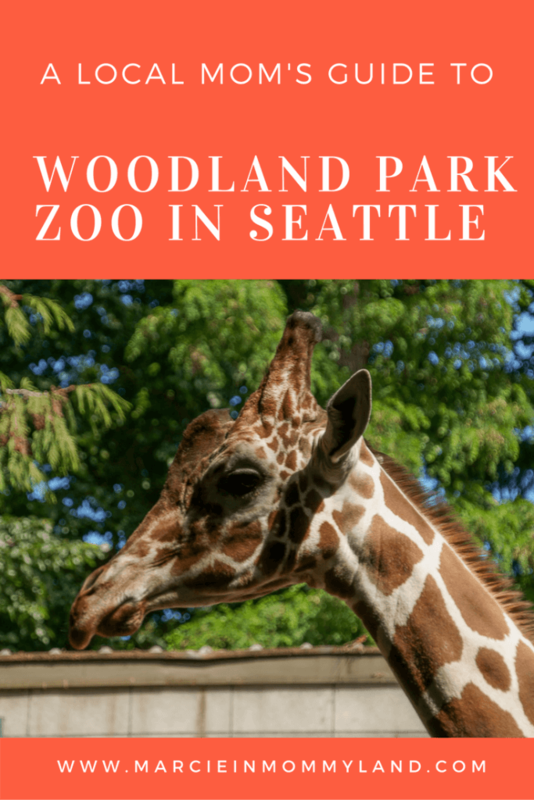 Thanks for your Local Mom’s Guide to Seattle’s Woodland Park Zoo! I love visiting Seattle! I will try to stop by there next time we are in town! Isn’t Seattle such a fun city to explore! I really love our zoo! My husband worked for the Philadelphia Zoo when he was just out of college. And he always talks about the sloth bear. I’d never seen one before. They are cute. I’m so glad to finally have a visual. Yes, they napped very well on the car ride home! I love zoos and this one in particular looks very exciting. I love your photographs. Thanks for sharing this, I have bookmarked it for future reference. I love taking Madison to the zoo because it makes her appreciate animals more. I love that there’s plenty to see here and there’s a butterfly garden as well, that’s a huge plus for me! Thanks for sharing this guide! My son has so many “aha” moments at the zoo! He also appreciates them more after seeing them! What a well designed zoo. It’s so great when zoos give you the opportunity to learn about animals while also offering places for kids to play and get out some of their energy. This looks like a lovely zoo! We went to a zoo near where we live a couple of weeks ago and it’s so much fun to watch the animals. You took some great pictures, it’s my favourite thing to take photos of animals! It’s super fun to take photos of animals! I haven’t been to a zoo in a while… I am one of the very few people in the world that don’t like visiting zoos. Of course, I have 2 little ones that love to visit the zoo. I don’t like the smell nor seeing the animals in cages. I understand totally why we have them, but not a big fan. Your guide is very informative however. This is such a great post! Looks like such a great activity and I’m always for hanging out with giraffes. I haven’t been to a zoo in forever but perhaps I should give them more chances. They can be really amazing when done right! Yes, the key is they have to be done right. I love what Woodland Park Zoo has done. Oh how I love trips to the zoo! These photos are gorgeous and Woodland Park Zoo looks just incredible, would love to visit! This looks like a lovely day out for the family. That baby giraffe is so cute! Thanks for sharing helpful tips too. This zoo looks like it is spectacular. My kids are so in love with seeing animals and would love this. It’s really well done! In fact, I just completed a survey they sent me and it looks like they are thinking about the next phase of the Zoo. I love going to the zoo! It has been at least a year since I’ve been to one. This one looks fantastic.